SEATTLE, WA (August 17th, 2016) – RiverFall Credit Union ($121M) opened its new headquarters in Tuscaloosa, Alabama this spring. The new 12,215 sq. ft. headquarters was a design-build project. The design, based on a collaborative planning session with the Momentum and RiverFall teams, fully integrates RiverFall’s new brand identity. 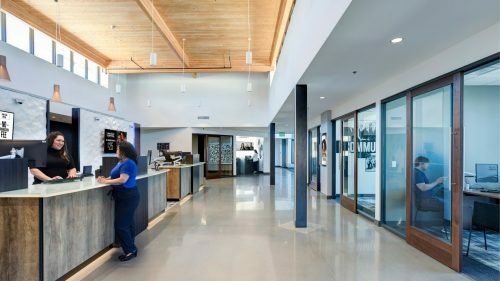 The building is open and welcoming, embracing the culture of southern hospitality with a sitting area in the headquarters branch that offers bottled water and coffee for visitors. 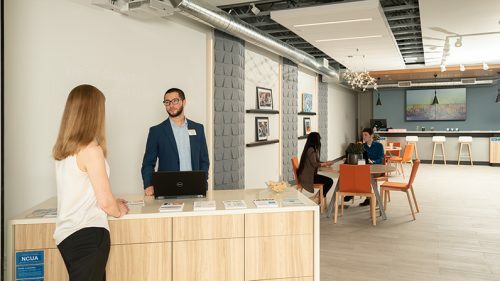 One of the most popular features is the community room, which is a meeting space accessible to local organizations and small businesses for meetings and training events when not in use by RiverFall. “You have one of the best meeting sites in town,” says Jim Page, president of the Chamber of Commerce of West Alabama. The operations area includes a number of open workspaces, executive offices and a board room, a kitchen, and a contact center. The design accounts for 15 years of growth and expansion of each department. “We have everything we need to go well into the future,” said Greg Sassaman, CEO of RiverFall. The design-build method, which features a collaborative relationship between the designers and builder from the beginning, added significant value to the project. 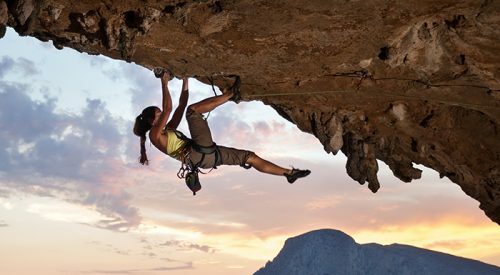 “The RiverFall team was truly a pleasure to work with, as from the beginning, they offered a clear vision to us of who they were, where they wanted to go and how they wanted to get there. We were fortunate to be able to develop a strategic facilities plan for their team,” said Bob Saunders, EVP and Partner at Momentum. RiverFall was able to select a target cost, and Momentum’s project team worked with subcontractors to get accurate estimates during the design phase and maximize the value of the design. In a typical project, the design is completed before bidding and establishing relationships with subcontractors, which makes redesigns more frequent, time intensive, and costly. Momentum partnered with Weber Marketing to help create and deploy RiverFall’s new brand identity. Formerly Tuscaloosa Teachers Credit Union, the new name was a critical part of RiverFall’s expanded charter. “It’s always great to see the culmination of a client’s hard work and dedication to a project like this when it includes a new name and brand combined with the new experiences members will enjoy in their branches with the collaboration and insight of the work done by Momentum,” Randy Schultz, Vice President of Marketing at Weber Marketing, reflected on the Credit Union’s success. 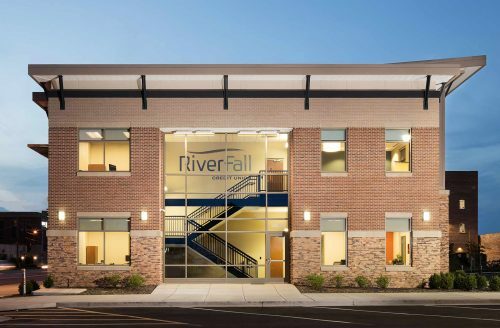 RiverFall Credit Union has two branch offices in addition to its new main office in Tuscaloosa, Alabama and serves more than 8,700 members in a six county area of West Alabama. The $120m credit union opened in 1953 as Tuscaloosa Teachers Credit Union primarily serving the area’s educators. After the completion of multiple facility projects (renovation of existing as well as new construction) and the successful launch of its new name and brand in 2015, the credit union is looking forward to continued growth and expanded opportunities to help its members find their pace and grow their lives.